Holi seems incomplete without sweets, and when it comes to easy-make sweets, Gujiya is an all-time favorite. 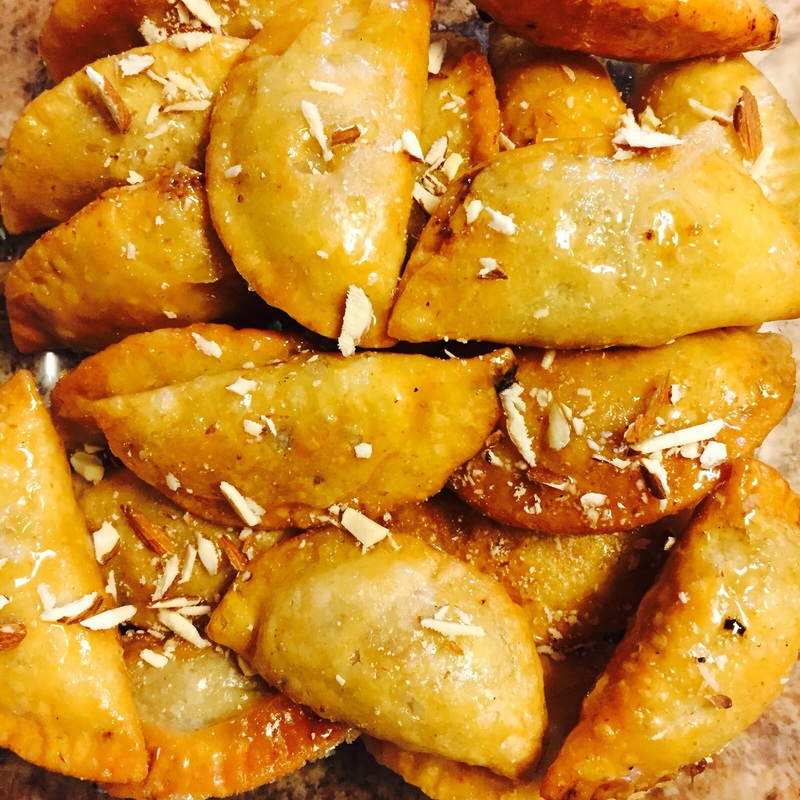 Soft flour pastry filled with sweet / savory filling of choice, Gujiya is typically made and served during Holi. Team Gujiyas up with thandai to bask in the festive feel any day during the year. Sift the maida into a mixing bowl and mix it with the ghee. To mix the ghee, use clean hands and rub the maida with the ghee within your palms. Keep rubbing until all the ghee is mixed in the maida and the mixture resembles breadcrumbs. Knead the mixture into stiff dough using the cold water. Cover the dough with a damp muslin cloth and keep it aside for about 15 minutes. Meanwhile prepare the filling. Place a deep non-stick pan over medium heat and saute the mawa in it for 3 minutes or until you can see the fat separated at the sides. Turn off the heat and set the mawa aside to cool to room temperature. Add all dry fruits to the mawa and mix well. Then divide the filling into 10 – 12 equal sized portions. Uncover the dough and divide it into 10 – 12 equal sized portions. Roll each portion within your palms into a ball. Then roll it out into a uniform circle using a rolling pin. Place one portion of the filling on the rolled out circle, lightly moisten one of the edges of the circle and fold it onto the other half making a semi-circle. Tightly seal the edges by pressing them together and use a fork to pinch the edges to make a design. Pour oil for deep frying in a deep frying pan and place it over high heat. Once the oil heats up nicely, carefully slide in the gujiyas few at a time. Deep fry to a nice golden brown color on both sides. This should take 5 minutes per sides. When done, transfer the gujiyas to a plate lined with paper towels. Before serving, garnish with grated almonds and warm the gujiyas up.